This trim hybrid jacket is designed as an active-use insulation layer, providing vital core warmth with liberal mobility and breathability. Lightweight and compressible, the Atom LT Jacket features Coreloft™ insulation in the torso and arms. Mid layers that can function as outer layers have varied degrees of weather shedding capability; they also have varied degrees of moisture management. Atom LT Jacket - Mens is rated 4.6 out of 5 by 46. Rated 5 out of 5 by Jeremy from Great Layering Jacket I use this jacket as a mid layer when skiing, where it performs perfectly. The jacket is very light and initially feels like it is too thin to be warm, but the Coreloft does its job. The jacket provides good breathability, and if it does get damp, dries very quickly. If you do get too hot, the jacket can be stuffed into a very small space in your pack. 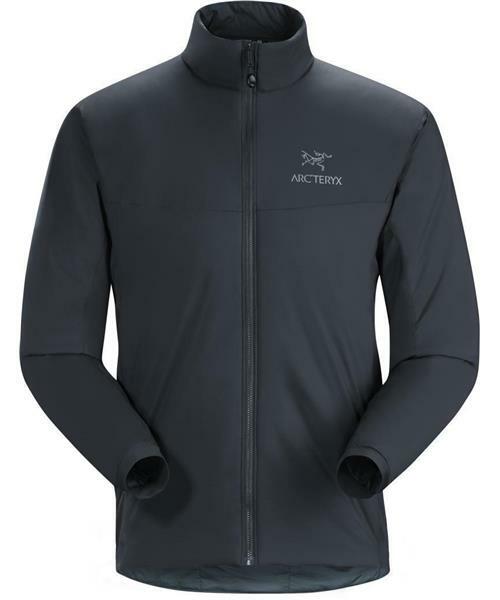 A consistent feature of Arcteryx clothing is the attention to sealing at the wrists, to prevent cold entering and heat escaping, and this jacket is no different I have the jacket in Blaze, which is even brighter than the image shown, and can surprise people when I take off my outer shell. Rated 4 out of 5 by Rick from Amazingly Thin For Warmth Have worn this mid-layer in 34F weather in mild wind. Under a shell, it was comfortable, but not toasty. Still, when you see how thin and supple it is, I find it amazing. I would never have predicted it. Build quality (mine is from Bangladesh) is great. Zipper is smooth. If not zipped all the way up, the zipper will slide down if you pull on the jacket above the zipper pull. I don't find this bothersome. When I am using it in an active pursuit, it works very well. If I am standing around in the cold, I don't shiver, but I know it's cold out there. If you are cold-blooded, I'd spend the extra bucks on the SV version. It's a 100g fill while the LT is a 60g fill. Rated 2 out of 5 by rpmars from Quality is deteriorating I been purchasing Arc'teryx products for over a decade, and until this year, have generally been enthusiastic and loyal. I needed to put my Atom out to pasture recently, and purchased the latest iteration. I was diasppointed to discover loose and dangling threads and what appears to be inferior materials. While I can;t speak with authority, it seems as though what other commentators are syaing about the degrading of the product since the brand was sold to Adidas and since they transfered production from Canada to China is true. Levis has done the same recently, and the quality and durability of the fabric is a downgrade. All signs of companies pursuing proftis while forgoing pride in craftsmanship. I will looking elsewhere in the future. Rated 5 out of 5 by Schlomie from Durable, Warm, Extremely Wind resistant, Light This jacket is one of my favorite mid-weight layers due to it's warmth, it's weight and it's wind resistant capabilities. I use it for a single layer as I commute to work and around town and the fit and wind protective properties are absolutely amazing. The side vents prevent me from overheating and even keep the wind out when I'm moving. I've used it with my shell in 14 degree F ambient and a wind chill of 0 and I was fine. I'm 5ft 8 and the small fits me perfectly. I even took a spill and skidded on asphalt for 1-2 feet and only got minor tears in it after that. Even though it looks light and not very durable, it will surprise you. I will definitely recommend it. Rated 5 out of 5 by Flatfoot from True Athletic Fit I wasn't looking for a crazy downfilled insulating layer or a arctic winter style jacket. So I am glad I got the Atom LT. I am 6'2 150lb athletic male and the sizing is fantastic (I got medium). I wear it as a solo piece or under my other shells. It is warm enough for spring and fall but still very breathable (heck I've even worn it in the summer). I do get cold so I would need to bulk up a bit more in the winter under my shells if I wasn't active, everyday kind of stuff. I am happy with its breathability and weight. I have friends with this jacket and they say the same thing. If you are looking for a lightweight insulation piece for active winter wear or seasonal everyday wear than this is the jacket for you. Rated 3 out of 5 by Islandspud from Warm and comfortable. Too fragile! Would have given a 5 star rating last week...Aboslutely love(d) this thing! I have owned for 2 weeks now. Surprised how light but warm it is. Very versatile. Great in a variety of temperatures. Was disappointed that in the first couple of days of use I got a pick in the coat when my shoulder brushed a concrete wall. Upon closer inspection there was nothing menacing on the wall...the outer material of the jacket does feel quite thin. Because of this, I believe that this jacket would be best suited as a mid-layer under the protection of a shell rather than as a standalone coat. I have a similar Lululemon jacket and while it is not as comfy or breathable, it surprisingly feels more durable. Rated 5 out of 5 by jcs3 from Well designed. My fall, winter, spring go to jacket. No zipper issues after a year's use. Hey, this work horse rocks! I'm 5'10"/210lbs with 48' shoulders so the XL covers it. Cycle year round and this is the ultimate 25-55 degree cycling jacket... just adjust the base layer. Relaxed fit and a great wind blocker. Heat up then just drop the zipper to vent. Ultra-light weight and comfortable. Expensive... not really because it works across many sports. Also use it for early winter and spring skiing front side and backside. The cayenne color is ultra visible for cycling. A versatile quality piece of Arcteryx gear. Cheers!